I finished my maroon skirt and a new vest for a high tea this afternoon. Events are such good deadlines. I think the vest could fit better at the back waistline. I added tails to the vest in back, and I'm still not sure if the tails flatter my good part or make worse my worst part. I used some of the remaining maroon linen as lining, and brown tropical wool suiting as the outer layer, with mother-of-pearl buttons. I also practiced my welt pockets and added one to the vest. And check out my cool party favor- embroidered silk ribbon flower hanky. It snowed pretty wildly this morning. We've gotten more snow in February than we did in December and January put together. We all stayed home except for Caleb, who doesn't mind driving in snow. Today I made a linen skirt. I've said it before and I'll say it again, linen is just the best. I order often from fabrics-store.com, so I get the email deals and such. This month they had a deep maroon medium-weight linen go half-off for a day, and so I bought three yards with my saved store points. You don't often get linen for $4.50 a yard! 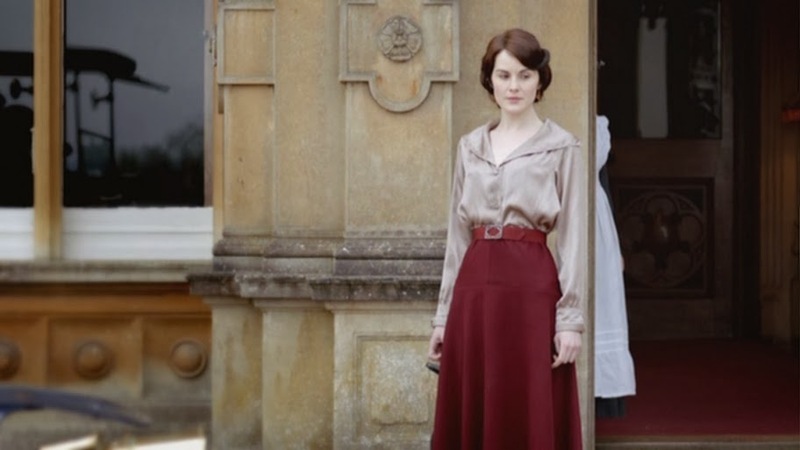 Lady Mary of Downton Abbey, Season two-ish, in a nice maroon skirt. I used this basic Simplicity pattern and it turned out fine; I also added welt pockets and lining(pictures may eventually follow). 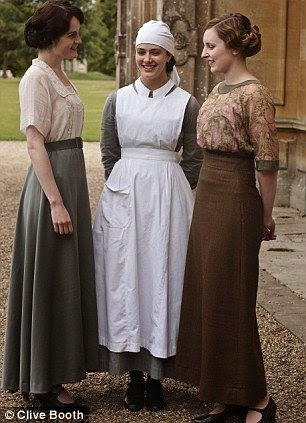 I prefer fitted-waist flared-skirt patterns- Very Downton Abbey and much more flattering than gathered waists. 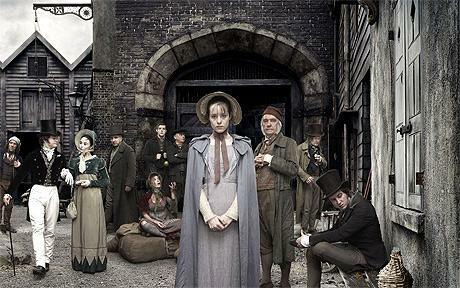 I love the every-day dress in Downton Abbey. I've never been a fancy dress sort of person; I much prefer plain and simple. Mary in another maroon skirt. 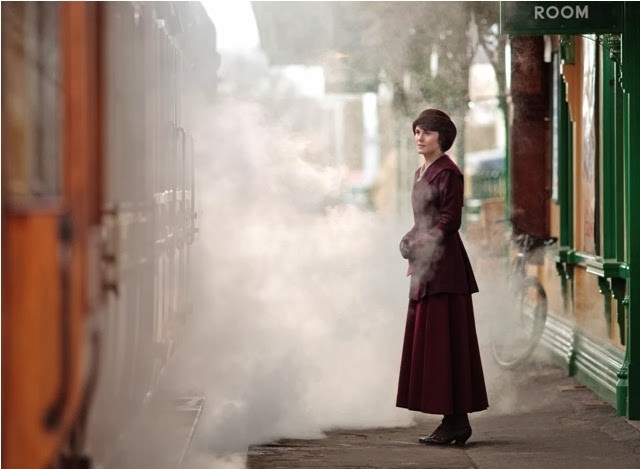 I traveled by train a fair amount in Scotland and a bit in Russia, and can I say it's not so romantic as this picture makes you believe. The train stations in Scotland did seem to be painted either green or purple, though, like in this picture. Mary in another really nice looking skirt. Though if we were all tall and skinny like this we'd look good whatever we wore. 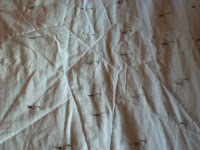 The Pistachio Quilt has begun. 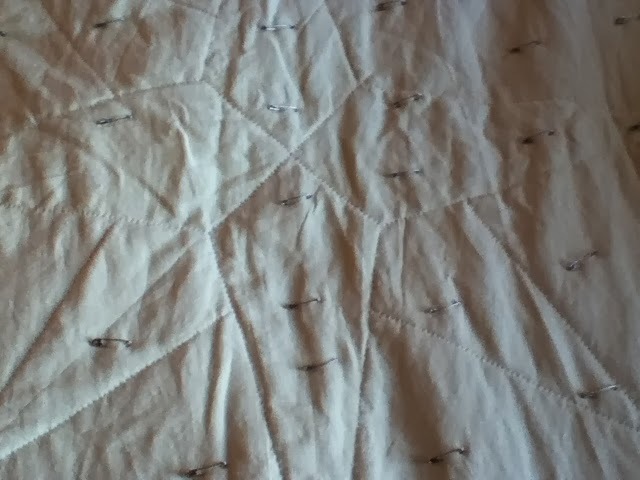 I've safety-pinned more than half and started the central star medallion, and it's all very exciting. It's a North Star pattern, with eight spikes. This month I bought a couch(Craigslist win) and made cheese. Loving the couch, worried about the cheese. It just doesn't smell too good. In fact, it smells really bad, but I can't bring myself to throw it out. Jobs: This week I had an interview with Princess Hoodie(code name) and another tomorrow with the Clothing Shed(also code). Princess Hoodie is seasonal sewing from home, as many hours as I'm willing to take. The Clothing Shed is the job I mentioned back in December before I was hired at O2FS. It's a location closer to home and has a Christian manager. They weren't hiring back then, and I was surprised to get a call from them this week asking for an interview. We'll see what comes of that. Today I took a picnic lunch to the Fort. It turns out that yes, the chimney does have a flue; and not knowing which way was open or closed, I had to find out through trial and error. My first trial was error. I lit a fire and the room filled with smoke; I had to throw snow on it to put it out so I could reach in to pull the flue open. Even after that it was incredibly smoky, and by the end of lunch I was thoroughly smoked. But it was still really cool to see the Fort again.